Heat-related illnesses, such as heat exhaustion and heatstroke, occur when your body can't keep itself cool. As the air temperature rises, your body stays cool when your sweat evaporates. On hot, humid days, the evaporation of sweat is slowed by the increased moisture in the air. When sweating isn't enough to cool your body, your body temperature rises, and you may become ill.
What should I do if I think I have heat exhaustion? If you think you have heat exhaustion, get out of the heat quickly. Rest in a building that has air-conditioning. If you can't get inside, find a cool, shady place. Drink plenty of water or other fluids. Do NOT drink alcohol or caffeinated drinks (such as soda). These can make heat exhaustion worse. Take a cool shower or bath, or apply cool water to your skin. Take off any tight or unnecessary clothing. If you do not feel better within 30 minutes, you should contact your doctor. 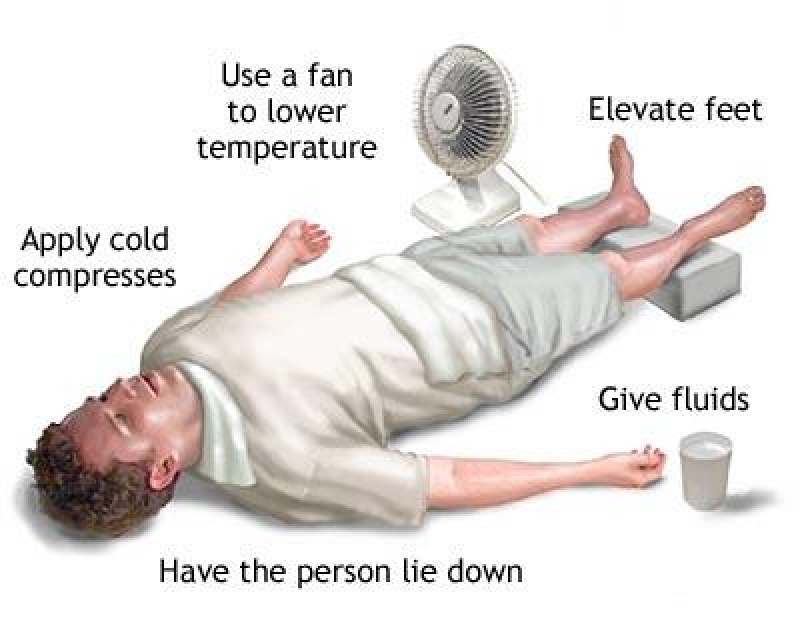 If heat exhaustion is not treated, it can progress to heatstroke. Heatstroke is when the internal temperature of the body reaches 104°F. It can happen when your body gets too hot during strenuous exercise or when exposed to very hot temperatures, or it can happen after heat exhaustion isn't properly treated. Heatstroke is much more serious than heat exhaustion. Heatstroke can cause damage to your organs and brain. In extreme cases, it can kill you. What should I do if I think someone has heatstroke? If you think someone might have heatstroke, call emergency medical personnel immediately. While you are waiting for medical assistance, take the person into an air-conditioned building or a cool, shady place. Remove the person's unnecessary clothing to help cool him or her down. Try to fan air over the person while wetting the skin with water. You can also apply ice packs to the person's armpits, groin, neck and back. These areas contain a lot of blood vessels close the surface of the skin. Cooling them with ice packs can help the person cool down. Tell your doctor what medicines you are taking. He or she can tell you if your medicine puts you in danger of heatstroke. What does the "heat index" mean? The heat index tells you how hot it feels outside in the shade. It is not the same as the outside temperature. The heat index is a measurement of how hot it feels when relative humidity is combined with the effects of the air temperature. When you are standing in full sunshine, the heat index value is even higher. A heat index of 90°F or higher is dangerous. Drink plenty of water before starting an outdoor activity. Drink extra water all day. Keep in mind that heat-related illnesses are not only caused by high temperatures and a loss of fluids, but also a lack of salt in the body. Some sports drinks can help replenish the salt in your body lost through sweating. Drink fewer beverages that contain caffeine (such as tea, coffee and soda) or alcohol. Schedule vigorous outdoor activities for cooler times of the day -- before 10:00 a.m. and after 6:00 p.m.
During an outdoor activity, take frequent breaks. Drink water or other fluids every 15 to 20 minutes, even if you don't feel thirsty. If you have clear, pale urine, you are probably drinking enough fluids. Dark-colored urine is an indication that you're dehydrated. If you have a chronic medical problem, ask your doctor about how to deal with the heat, about drinking extra fluids and about your medicines. What should I do after having heat exhaustion or heatstroke? Having heat exhaustion or heatstroke makes you more sensitive to hot conditions for about a week afterwards. Be especially careful not to exercise too hard, and avoid hot weather. Your doctor can tell you when it is safe to return to your normal activities.